Child Development Worldwide presents a topical examination of all stages of development — from prenatal development through middle childhood, adolescence, and emerging adulthood — through the engaging lens of culture. Cross-cultural examples integrated throughout the narrative reveal the impact of cultural factors both in the US and around the world. 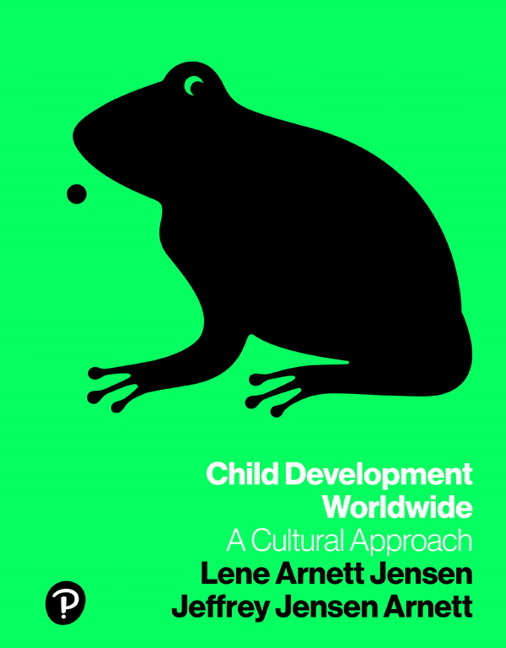 Authors Lene Arnett Jensen and Jeffrey Jensen Arnett emphasize culture to foster a thorough, balanced view of development that prepares students to face challenges in our diverse and globalized world — whether they travel the globe or remain in their hometowns. 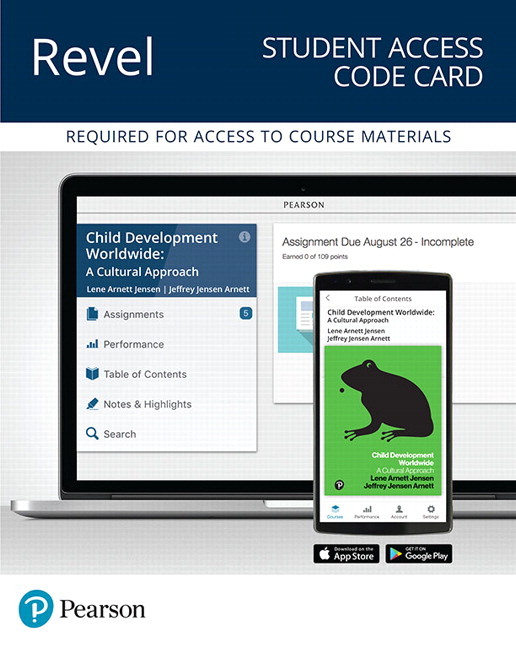 Child Development Worldwide is also available via Revel ™, an interactive learning environment that enables students to read, practice, and study in one continuous experience. Learn more . 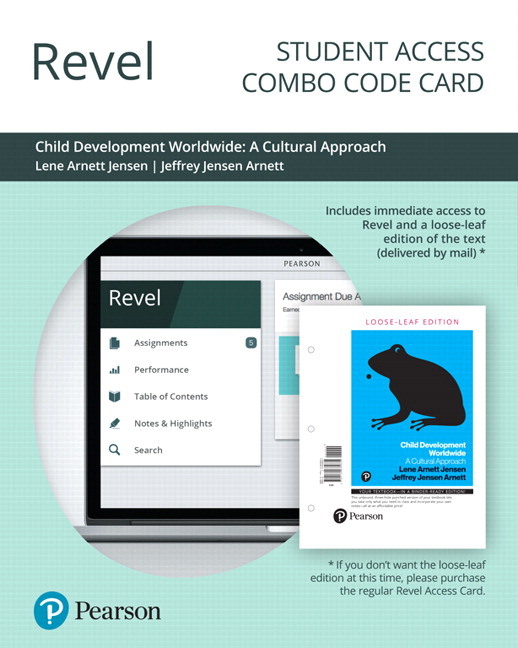 Throughout the text, the authors teach students to think culturally about development. Transcending the old “nature versus nurture” division, the text shows how humans have evolved to be an incomparably cultural species, and explains the ways that genes and the environment influence one another. The authors present a broad scope of child development, with in-depth coverage from prenatal development through middle childhood, adolescence, and emerging adulthood. Their contemporary perspective on when children may be considered “grown up” helps students to understand how the meanings of childhood, adolescence, and emerging adulthood are dependent upon cultural and historical circumstances. Child Development Worldwide covers a rich array of contexts — what they look like in today’s world and how they intersect. This contextual focus helps students to understand the many environmental and cultural factors that influence development. Breaking Developments articles writen by the authors provide succinct summaries of landmark new research and significant cultural trends that have direct relevance to child development theory and research. Cultural Focus features highlight how culture impacts various aspects of development, such as breast-feeding practices, or what it means to be a teenager in Kathmandu. Students read an overview of the topic and then answer a review question. Education Focus features highlight the application of child development research to educational settings, both in and outside of school. Students read an overview of the topic and then respond to a review question. Research Focus features offer a detailed description of a research study, including its premises, methods, results, and limitations. Multiple choice questions at the end of the feature ensure that students have a solid understanding of the research study and methodology. Critical thinking questions encourage students to think more deeply about a developmental topic, often focusing on the role of culture in child development. First-person quotes from children, adolescents, and emerging adults from around the world yield insights into other individuals’ perspectives, which adds authenticity to the presentation of theories and research findings. 3.5 Caring for the Neonate: Is Breast Best? CULTURAL FOCUS: Is Contemporary American Culture Setting off a Genetic Tripwire for Obesity? Lene Arnett Jensen is Associate Professor in the Department of Psychology at Clark University in Worcester, Massachusetts. She received her Ph.D. in developmental psychology in 1994 from the University of Chicago, and did a one-year postdoctoral fellowship at the University of California — Berkeley. Prior to coming to Clark University, she taught at the University of Missouri and Catholic University of America. She aims through scholarship and professional collaboration to move the discipline of psychology toward understanding development both in terms of what is universal and what is cultural. She terms this a “cultural-developmental approach.” Her research addresses moral development and cultural identity formation. Together with her students, she has conducted research in countries such as Denmark, India, Thailand, Turkey, and the United States. Her publications include New Horizons in Developmental Theory and Research (2005, with Reed Larson, Jossey-Bass/Wiley), Immigrant Civic Engagement: New Translations (2008, with Constance Flanagan, Taylor-Francis), Bridging Cultural and Developmental Psychology: New Syntheses for Theory, Research and Policy (2011, Oxford University Press), the Oxford Handbook of Human Development and Culture (2015, Oxford University Press), Moral Development in a Global World: Research from a Cultural-Developmental Perspective (2015, Cambridge University Press), and the Oxford Handbook of Moral Development (forthcoming, Oxford University Press). From 2004 to 2015, she was editor-in-chief for the journal New Directions for Child and Adolescent Development (with Reed Larson). She served as program chair for the 2012 biennial conference of the Society for Research on Adolescence (with Xinyin Chen), and recently served on awards committees for the Society for Research on Child Development (SRCD) and the Society for Research on Adolescence (SRA). For additional information, please see lenearnettjensen.com. Jeffrey Jensen Arnett is a Research Professor in the Department of Psychology at Clark University in Worcester, Massachusetts. He received his Ph.D. in developmental psychology in 1986 from the University of Virginia, and did three years of postdoctoral work at the University of Chicago. From 1992–1998 he was Associate Professor in the Department of Human Development and Family Studies at the University of Missouri, where he taught a 300-student lifespan human development course every semester. In the fall of 2005, he was a Fulbright Scholar at the University of Copenhagen in Denmark. His primary scholarly interest for the past 20 years has been in emerging adulthood. He coined the term, and he has conducted research on emerging adults concerning a wide variety of topics, involving several different ethnic groups in American society. He is the Founding President and Executive Director of the Society for the Study of Emerging Adulthood (SSEA; www.ssea.org). From 2005 to 2014 he was the editor of the Journal of Adolescent Research, and currently he is on the Editorial Board of JAR and five other journals. He has published many theoretical and research papers on emerging adulthood in peer-reviewed journals, as well as the books Adolescence and Emerging Adulthood: A Cultural Approach (2018, 6th edition, Pearson), and Emerging Adulthood: The Winding Road from the Late Teens Through the Twenties (2015, 2nd edition, Oxford University Press). For more information on Dr. Arnett and his research, see jeffreyarnett.com. Lene and Jeff live in Worcester, Massachusetts with their twins, Miles and Paris.